Please note that Truck drivers went on strike in Brazil against rising fuel prices for the second day on Tuesday, threatening the country’s sluggish recovery and pushing its cash-strapped government into a corner. Truckers complain that the cost of diesel fuel, which represents about 42% of their costs, is up 16% from a year ago. They have been blocking highways and urban traffic across the country, disrupting transportation in a nation that relies heavily on road transportation. 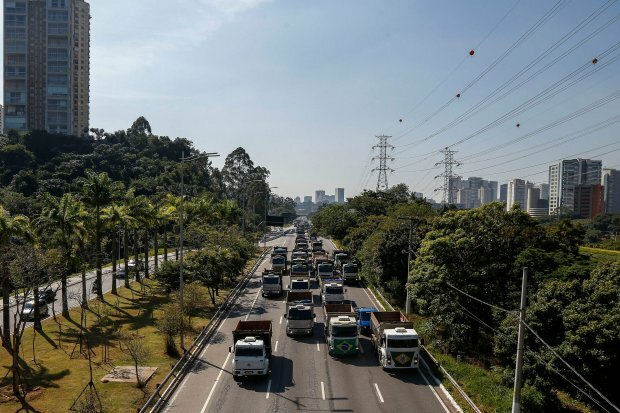 The national truckers association Abcam said Tuesday that 200,000 of the country’s nearly 1 million self-employed truck drivers are demanding that state oil giantPetróleo BrasileiroSA,or Petrobras, stop letting international oil prices trickle through to the pump. They also call for a reduction in fuel taxes. Although they are looking for solutions, however, a solution could be tricky. Investors react negatively to government meddling in Petrobras, and revenue from fuel taxes is key to curbing a gaping hole in the national budget. When oil prices remained above $100 a barrel between 2012 and 2014, the Brazilian government forced Petrobras to bear the brunt of higher costs and keep pump prices stable, sending the company’s debt load to more than $100 billion in 2016. Petrobras has since been permitted to adjust its sale price according to global markets, helping reduce its debt to an estimated $77 billion this year. The company says taxes represent as much as 45% of the price at the pump. Prices were raised last year as Brazil’s budget shortfall reached a worrisome 7% of gross domestic product after two years of recession. Brazil’s GDP grew only 1% last year and is forecast to expand 2.5% in 2018. Import and export shipments may be affected since we are not getting to deliver or pick up in some ports and airports. As the strike continues we will update you as much as possible. If you should have any questions or concerns, please feel free to contact us.